Something happened after returning from a convention. Something that confirmed my conviction that business owners should never use a third party platform (no matter how good it is) as their primary blog, or in lieu of their website. Well yeah ya do … and you should, if you’re serious about business, and want to protect your intellectual property. After attending a convention as a sponsor (for the 2nd year in a row), reconnecting with old friends, and connecting with a bunch of new ones, I set about the task of following up with them. In addition to the usual email and phone follow-up, I wanted to make sure I also connected with them on LinkedIn. If we weren’t already connected, I sent them an invitation. Mind you, I only sent invitations to those I already knew, or with whom I had a one-on-one conversation while at the event. And, I sent a personal note with each one, reminding them of how we met. I also added a snippet of our conversation whenever I could. Several of my invitations were accepted, and very nice messages were received. Much to my surprise, however, when I tried to log into LinkedIn to reply to a notice that someone had accepted my invitation so I could thank them … Bingo! I had been logged out. And when I tried to log back in again, there was a lovely message from the LI powers that be, telling me my account had been suspended, and I had to send them my first born child to prove who I was. Just kidding. They did, however, want a photo of either my driver’s license or passport to prove I was me. Not cool! I was locked out on a Friday morning, and not reinstated until the following Monday. Yes, I was reinstated; and yes, it was only for 4 days, so what’s the point? When I finally received the email telling me my account was reinstated, the reason was, “Thanks for reaching out to us about this. We noticed that an excessively high number of member profiles or pages were being viewed through your account, so we temporarily suspended it. To protect our members’ information, the User Agreement prohibits systematically viewing large numbers of LinkedIn pages.” Really? I’d love to see their definition of both “excessively high” and “systematically.” I don’t believe either term was accurate for me in this case or historically for me either. Are you REALLY the master of your domain (content)? The point is … IF I had been using LinkedIn as my main blogging platform, or in lieu of my website, I would have been dead in the water for 4 days. And what if my account hadn’t been reinstated? What then? I’ve seen the same thing happen to people on Facebook and Twitter — not just to the small time user, but to some heavy hitters. My Tumblr account was canceled once … by no fault of my own. Tumblr (a platform used by many as their main blogging platform) admitted it was their “error,” so it was reinstated after about a week. 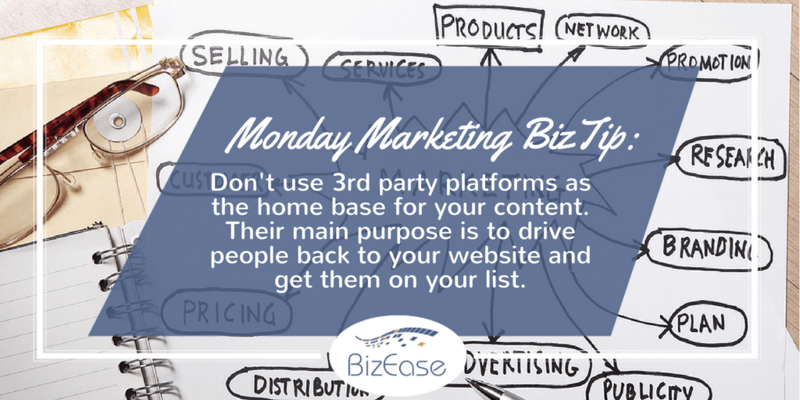 The main purpose of sharing content on 3rd party platforms, or social media, is to expand your reach, drive people back to your website, and get them on your list. Your website and your list are YOUR property, and you are in control. 3rd party platforms and social media platforms are NOT your property; and sadly, you can be booted out of them without any warning. So, the point of this article, is how important it is to establish your brand on your own website and blog. Share your content and blog posts on your own website and/or blog first, to establish you as the owner and keep your intellectual content safe. Then share and repurpose your content on some of these other sites, with the intent of driving them BACK to your website and getting them on your list. Social media and other 3rd party platforms are not meant to replace your website or blog. They are meant to enhance and extend your reach. End of story!